Sonia Nieto’s chapter points to the significant phenomenon of growing cultural diversity and the challenges it presents for educational change. Reviewing the evidence on ways of learning and what counts as learning in diverse cultures, and on the strong association between various levels of cultural diversity and poverty, Nieto argues that beyond the rhetoric, differences of race, culture, and language are rarely taken very seriously in educational reform efforts. 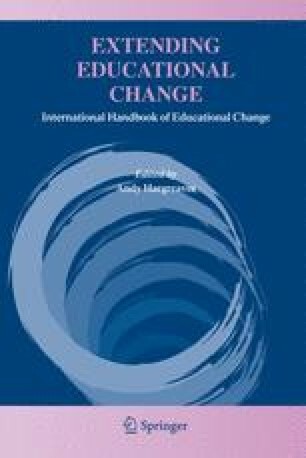 Yet, she shows how taking cultural and linguistic diversity into account in educational reform initiatives, can make a real difference in student learning and achievement — and she outlines numerous, concrete and practical examples of how this can be and sometimes has been achieved. In the second part of her chapter, Nieto spells out some educational change implications of her findings. She argues for better preservice teacher education that will prepare teachers effectively to work in contexts of diversity; for a more positive view of the strengths to be drawn from cultural difference; for whole-school policies that are sensitive to diversity issues; and for making social justice central rather than peripheral to an educational reform agenda that is currently too preoccupied with other interests and concerns.